You are here: Home / Taxes / Don’t Forget to Pay Your Quarterly Taxes! If you haven’t already, it’s time to file your taxes before they are due this upcoming Tuesday, April 15, 2014. For those who are self-employed, you also have to make sure cover your estimated taxes for the first quarter. 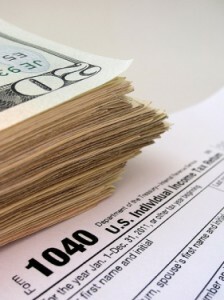 Estimated taxes are due on an almost quarterly basis. Our tax system in the United States is basically pay as you go – when you work as an employee your taxes are deducted from your paycheck each time. If you’re self-employed you are responsible for making the deductions. Here are the upcoming due dates for 2014. The goods news is that paying your quarterly taxes is pretty simple, with several options open to you. I personally pay my federal and state taxes online. It’s quick and it’s easy. If you want to find out how to enroll for EFTPS, check out my post on TurboTax’s blog to find out. If you underpay your taxes, there are penalties. The IRS will send you the bill.